There’s a new desktop snap in the Snap store: Simplenote. If you haven’t tried it yet, Simplenote brings a solid note taking utility to your day-to-day open source toolkit. 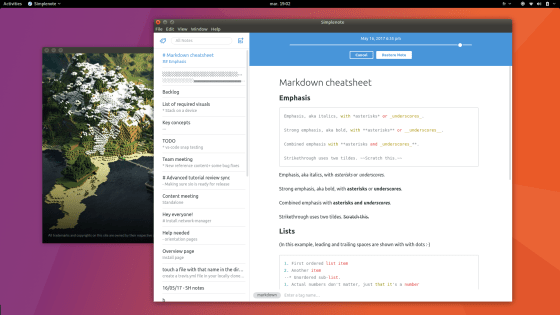 Don’t be fooled by a simple appearance, as it’s one of the most comprehensive editing suite around, especially for Markdown, with previews and extensive syntax support. While its most prominent feature is instant notes syncing across devices (and platforms — Linux, web, Android, Mac, Windows and iOS), Simplenote also comes with a tagging system and collaborative editing. For example, tag a note with someone’s email address to edit it together. If you want to make a note temporarily public, it even gives you the ability to publish notes as standalone webpages in two clicks. Why does it make sense to have Simplenote packaged as a snap? Snaps mean simple installation and update management with no need to worry about dependencies. It also means that when the software vendors make them available, it’s easier to access the beta version of their app or even daily builds. How many Linux packages format Electron developers need? While the right answer is probably “as many as they need to reach their full potential audience”, snapping Electron applications means building one snap that works on all the major Linux distributions, with support for more distributions growing. User install documentation can be simplified and your application will be discoverable by millions of Linux users in the Software Center. To ease the building process even more, the snap format is integrated with Electron Builder.